The paper Multicontrast connectometry: A new tool to assess cerebellum alterations in early relapsing‐remitting multiple sclerosis has been accepted in Human Brain Mapping. Background: Cerebellar pathology occurs in late multiple sclerosis (MS) but little is known about cerebellar changes during early disease stages. In this study, we propose a new multicontrast “connectometry” approach to assess the structural and functional integrity of cerebellar networks and con- nectivity in early MS. Methods: We used diffusion spectrum and resting-state functional MRI (rs-fMRI) to establish the structural and functional cerebellar connectomes in 28 early relapsing-remitting MS patients and 16 healthy controls (HC). We performed multicontrast “connectometry” by quantifying multiple MRI parameters along the structural tracts (generalized fractional anisotropy-GFA, T1/T2 relaxation times and magnetization transfer ratio) and functional connectivity measures. Subsequently, we assessed multivariate differences in local connections and network properties between MS and HC subjects; finally, we correlated detected alterations with lesion load, disease duration, and clinical scores. Results: In MS patients, a subset of structural connections showed quantitative MRI changes suggesting loss of axonal microstructure and integrity (increased T1 and decreased GFA, P < 0.05). These alterations highly correlated with motor, mem- ory and attention in patients, but were independent of cerebellar lesion load and disease duration. 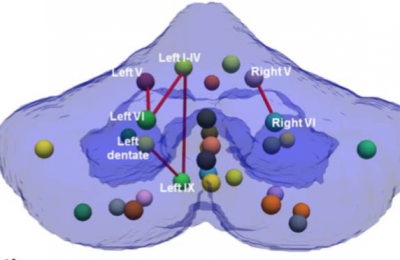 Neither network organization nor rs-fMRI abnormalities were observed at this early stage. Conclusion: Multicontrast cerebellar connectometry revealed subtle cerebellar alterations in MS patients, which were independent of conventional disease markers and highly correlated with patient function. Future work should assess the prognostic value of the observed damage.